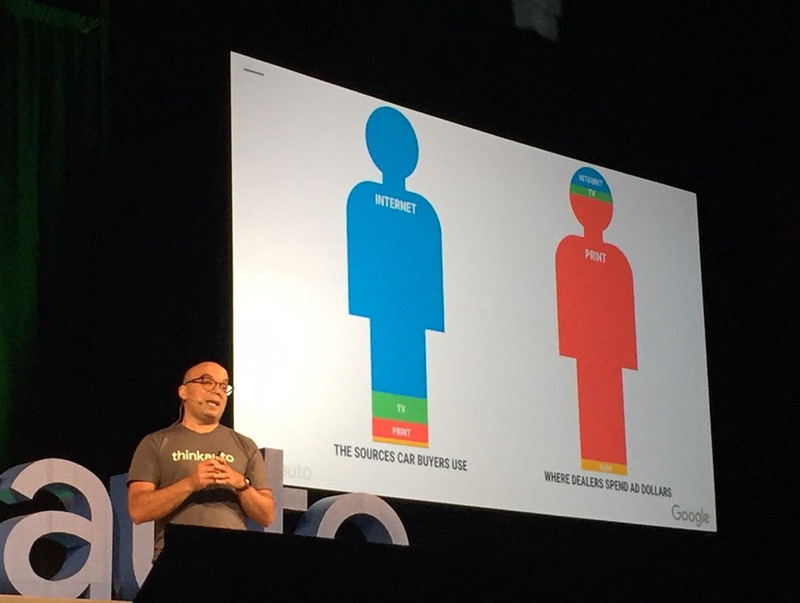 On September 8th, Google hosted their 11th annual thinkauto at the historic Massey Hall, downtown Toronto. Over 800 car dealers and auto marketers attended the event which featured an expanded guest list, live music, condensed agenda and an expansive, innovative research methodology for data collection. Sam Sebastian, Managing Director of Google Canada kicked off the event by throwing his slides aside and sharing a personal story about moving his family, specifically his anxious daughter to Canada where she would be starting high school. The moral of the story and ultimately, the day at thinkauto: change, and the importance of embracing it. Sam Sebastian, Managing Director of Google Canada kicks off Think Auto 2016 with a personal story about change optimism. Dave Resnick, Head of Automotive at Google Canada, began thinkauto by taking a deep-dive into the Car Buyer’s Journey. Dave presented the 5 principles of the car buyer’s journey and how these principles are changing. 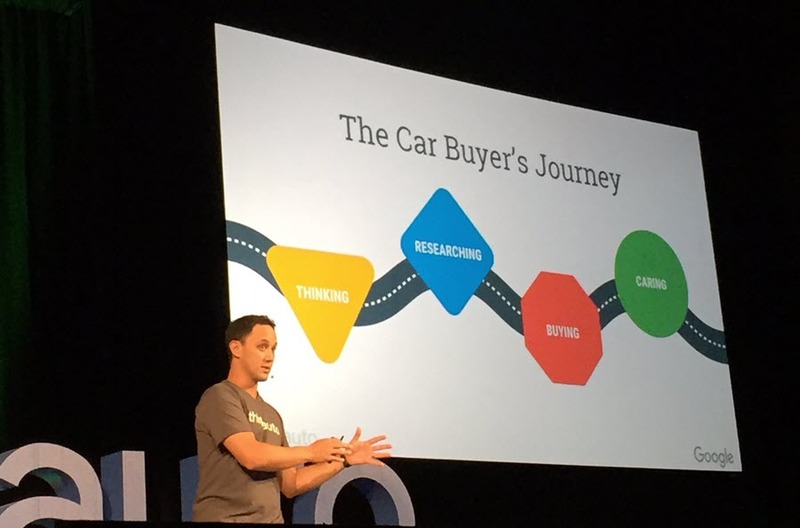 Dave Resnick, Head of Automotive at Google explains the 5 principles of The Car Buyers Journey. Ashley Hahn, Brand Strategist at Google Canada, stressed the importance of bringing the car experience into the home of car buyers through video. 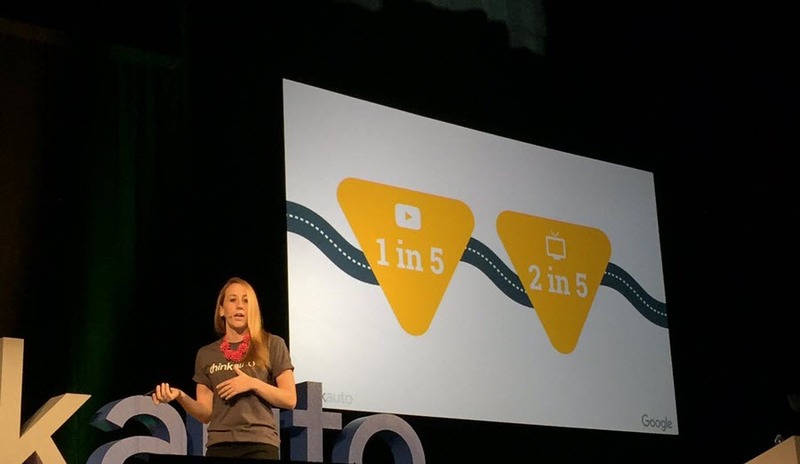 Ashley Hahn, Brand Strategist at Google Canada explaining the importance of video. She shared great video examples of different ways some OEM’s and dealers are bringing the car home for the shopper. Your customer can’t make time for a test drive? Let them test drive your car from their couch with a 360 degree video like the one below. Fareed Siddiqui, Automotive Account Manager at Google was the pessimist of the day. His presentation focused on mobile, and how the industry is performing when it comes to providing their customers with a seamless mobile user-experience. 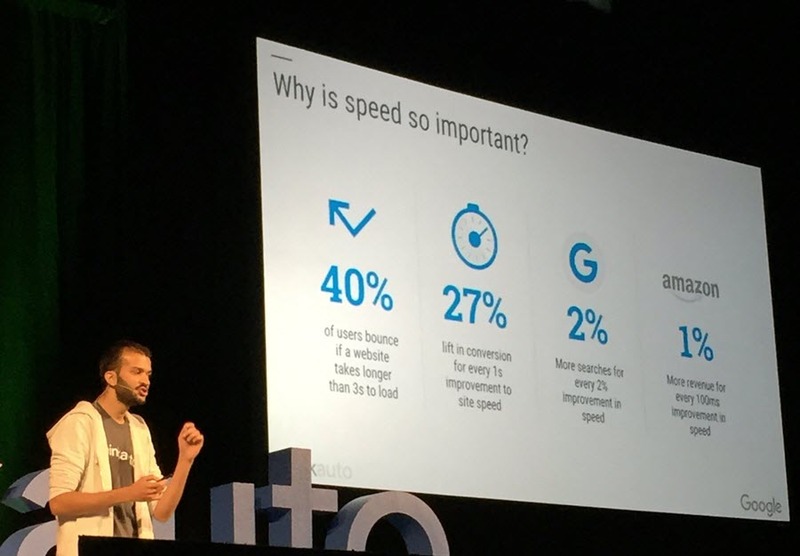 Fareed Siddiqui, Account Manager at Google explains the impact of mobile website pagespeed at Think Auto 2016. Plainly, Fareed was disappointed in the Canadian automotive industry as a whole. He highlighted painfully slow mobile website pagespeed by pausing in silence for a ridiculously awkward 23 seconds. This time frame represented the slowest load time for an OEM mobile site. We’re pretty sure it’s a luxury brand, but we’re not saying who. He continued to present industry shortcomings on mobile using a live birds-eye-view shot of his smartphone to showcase mobile sites in other industries (banking and fashion) who give their users flawless mobile experiences. Andrew Assad, Strategy & Insights Manager at Google Canada, followed Fareed’s eye-opening presentation sensibly by examining the challenges and opportunities all dealerships have because of changing technology and its effect on consumer expectations. 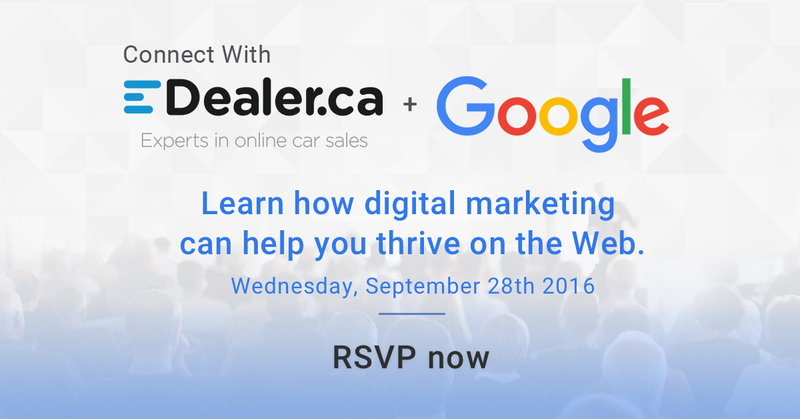 Andrew Assad, Strategy & Insights Manager at Google Canada compares the sources car buyers use with where dealers spend ad dollars. Andrew’s presentation focused on encouraging dealers to buy-in and lean-in to digital with the goal of aligning investment with consumer reality. Furthermore, he preached the importance of dealerships treating their internet presence with the same love as their physical dealership. To evolve alongside technology Andrew shared ways to improve the customer experience throughout the entire journey with simple changes like timelier and more relevant email response from the dealership. Challenges and opportunities for car dealers in Canada. Deepak Anand, Head of Auto Industry, Google Canada closed out thinkauto 2016 with a powerful final presentation targeting technological disruption and how it continues to impact the automotive industry. Deepak Anand, Head of Auto Industry at Google Canada closing out thinkauto 2016 with a discussion on technological disruption in the auto industry. Deepak discussed the big names that are always thrown around when the word “disruption” is mentioned: Uber, AirBnB, Netflix and more. His message: don’t be the cab companies, hotels, and Blockbuster’s of the auto industry, be the Uber’s, AirBnB’s and Netflix’s. Leverage technology to improve your business or somebody else will. Deepak also previewed some exciting technology with the potential to put a tonne of research power into the hands of anyone with a smartphone. As the person in the video walked through the dealership lot and pointed their phone at vehicles, object detection software would detect the vehicle, make, model, year and more in real time. Source: Google Canada & Ipsos – Canadian Car Buyer Journey 2016. Ipsos I-Say and partnering panels. Online, device agnostic survey. June 23 – July 11, 2016. Representative sample of n=5,000 Canadians 18+ currently in the process of buying a car n=1,500 Thinking phase; n=1,500 Researching phase; n=2,000 Buying phase. Sample balanced to reflect demographic profile of Canadians in the market for a vehicle. Source: Google Canada & Ipsos – Dealership Outlook & Marketing Perspective Study 2016. Online, device agnostic survey. July 14 – Aug 19, 2016. Sample of n=138 Dealer Marketing Decision Makers. Want to learn more? Need a partner to help your dealership buy-in to digital? Drop us a line.